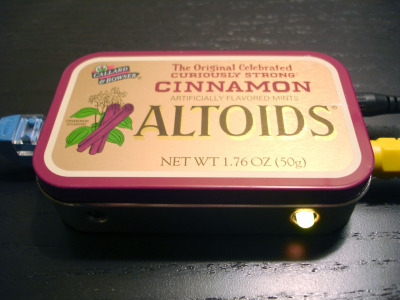 The ybox2 is the second-generation networked set-top box in an Altoids tin. Inspired by the original ybox, created by Uncommon Projects. Total cost to build one is around $50, much cheaper than the original. Kits are now available! See below for details. New in v1.1! Easy access to all I/O pins and power rails via 0.1" grid alligned headers, which allows for the creation of snap-on extension boards! You can buy the ybox2 kit from Adafruit Industries for $75, which will save you from having to try and find all of the parts yourself. You can also buy just the ybox2 board for $15. You can find the most up-to-date parts and price list here. Note: The parts list is for the v1.1 boards! 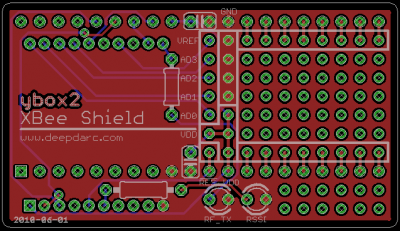 The v1.0 boards have a different regulator and a common cathode LED. You can either browse the sources there directly, or check them out yourself. ybox2 tin drill guide ONLY FOR v1.1 (adafruit) boards! Also check out the ybox2 flickr tag!